We need oxygen to survive. Even the cells in the deepest, darkest parts of our body can’t live without it. But some cancer cells adapt to survive in very low oxygen levels, and these end up being some of the most difficult to treat. Scientists in labs around the world are working to uncover the molecular machinery that allows cells to do this. And they hope to outsmart tumours by developing treatments that break these mechanisms. This month our scientists discovered an important part of the oxygen-sensing machinery of tumour cells, which may be an early step towards a new way to treat cancer. As tumours rapidly grow and expand, the network of blood vessels bringing oxygen to their cells can’t keep up, leaving some cells starved of oxygen, or ‘hypoxic’. This would kill normal cells, but cancer cells have evolved to beat these conditions by switching on a protein called hypoxia-inducible factor (HIF), which in turn switches on other molecules inside the cell. This cascade, called the HIF response, encourages new blood vessels to grow around and into the tumour. It also helps the tumour to adapt to hypoxic conditions by using alternative methods to produce energy. A cell generates energy to grow and survive inside tiny ‘power stations’ called mitochondria, by using oxygen to fuel chemical reactions. And it’s been known for some time that mitochondria have an important role in flicking the ‘HIF’ switch. But researchers were in the dark as to exactly how mitochondria are involved. So a team at University College London, led by Dr Margaret Ashcroft, set out to investigate. The research, published in this month’s Journal of Clinical Investigation, delved into mitochondria’s inner workings and found that oxygen levels are monitored by a protein called CHCHD4. When oxygen levels fall below a critical level, this protein activates the HIF response. In lab experiments, the researchers also varied the levels of CHCHD4 in cells starved of oxygen. When CHCHD4 was blocked entirely, it stopped the action of HIF in cells, stopping cancer cells from growing and �C importantly �C preventing the growth of new blood vessels. 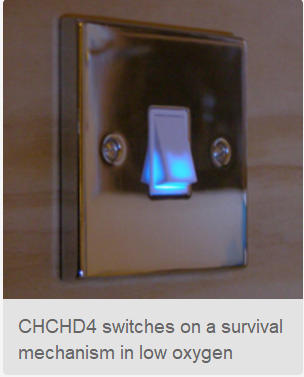 But when too much CHCHD4 was switched on in oxygen-starved cancer cells, large amounts of HIF were activated. This kick started a sequence of events that allowed cells to survive in low oxygen. And it seems CHCHD4 has this HIF-activating role in a number of different types of cancer. The team looked at samples from 236 breast cancer patients, and found that levels of CHCHD4 were greatest in samples that were most aggressive, and came from patients with poorer survival. They also found raised levels of CHCHD4 in samples from patients with pancreatic cancers and gliomas (a form of brain tumour). Again, in these cancers, they found that increased levels of CHCHD4 were associated with more aggressive tumours and poorer survival. As we said above, tumour cells that are able to thrive despite low oxygen levels are more likely to be resistant to treatment. Previous research has shown that targeting the HIF response can block tumour growth and spread, and improves the effect of drugs that halt the growth of new blood vessels (so-called ‘anti-angiogenics’), so these results could hold promise for more effective cancer treatments in the future. Dr Ashcroft thinks the work opens a new area in our understanding of how tumour cells adapt and survive in an environment with little oxygen. “We can now look at new ways of targeting this process by modulating the action of CHCHD4, hopefully leading to new drugs that could be used against those cancers that are difficult to treat,” she told us. Her team now plans to continue this work in further studies, and we’ll be keeping an eager eye on her progress in this exciting field.